WASHINGTON, Feb. 6, 2019 /PRNewswire/ -- Wounded Warrior Project® (WWP) announced a grant in support of Blue Star Families (BSF), a national nonprofit that aims to strengthen military families by connecting them with the greater civilian communities where they serve. This $250,000 grant will help bridge the military-civilian gap by bringing together public, private, and philanthropic organizations with military families in their communities through the BSF Neighborhood program model. With fewer than half of 1 percent of the American population serving in uniform and shouldering the responsibility of our common defense, military families often feel isolated from their civilian counterparts. Many civilians want to engage with and help support military members and their families but are unsure how. "Military families experience unique challenges – especially when their servicemember deploys overseas on combat operations," said René Bardorf, WWP senior vice president of government and community relations. "In most instances, these military families live far from their hometowns, relatives, and traditional networks of support. 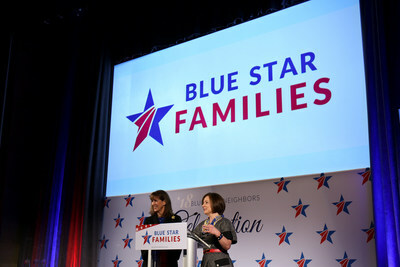 Blue Star Families facilitates community connection by providing civilians opportunities to engage and help and support military families. By ensuring strong, stable military families, we increase the morale of our force and enable servicemembers to focus on their mission of defending our great nation." "Military families tell BSF their struggles through the Blue Star Families annual Military Family Lifestyle Survey," said Kathy Roth-Douquet, BSF Chief Executive Officer. "A top concern, two years in a row, has been community integration; 51 percent of respondents indicated they do not feel part of the civilian communities in which they live and want more significant opportunities to connect to their communities. Partnering with Wounded Warrior Project is one way we're fostering stronger communities to mitigate isolation, lend support, and increase employment opportunities for spouses." Since 2012, WWP has partnered with over 120 organizations involved in the care of America's military community by providing more than $74 million in grants. To learn more about how WWP partnerships with organizations like BSF (https://bluestarfam.org) improve the lives of millions of warriors and their families, visit https://wwp.news/Newsroom.